Most of you are probably aware that our area has been heavily impacted by a severe and extended red tide. However, red tide doesn’t usually blanket an entire area, it is often patchy and can change from day to day depending on wind direction and tidal flow. There are some areas that are unaffected and fish may concentrate in those areas, so the key to good fishing now is finding clean water that is unaffected by red tide. Red tide doesn’t do well in fresh water, so areas where salinity is diluted by fresh water such as creek and river mouths, may be a good option. As this is being written, the Florida FWC has enacted a temporary modification of regulations for reds and snook, in the areas affected by the recent red tide. The area extends from Pasco County, south to the south bank of Gordon Pass in Collier County. Reds and snook will be catch and release only until May 10, 2019. I applaud them for taking this action to protect our fishery. Full details including exact boundaries can be found at http://myfwc.com/news/news-releases/2018/september/26/comm-red-tide/ . That being said, areas of Tampa Bay, Charlotte Harbor and the coastal Gulf of Mexico should turn on this month. Schools of reds will begin to break up and scatter on shallow flats. 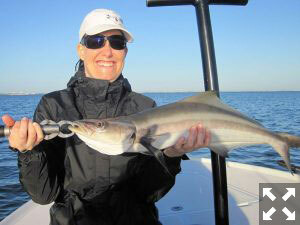 There should also be good action with snook and big trout in shallow water. Snook will gorge themselves at night around lighted docks in the ICW. There should also be good action in the coastal gulf with Spanish mackerel, false albacore (little tunny), tripletail and cobia. You might also still find tarpon anywhere from upper Charlotte Harbor and Tampa Bay to along the beaches. Jon Yenari caught and released this snook on a fly. 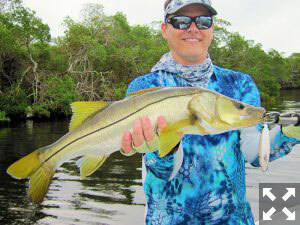 Snook will move from passes and the surf as water temperature cools and days get shorter. They will stage around docks and bridges in the ICW and along sand bars, potholes and along mangrove shorelines. They may blow up on top water plugs or fly poppers in shallow water early or late in the day. CAL jigs with shad tails and jerk worms or DOA Shrimp should work well around docks and bridges and on shallow flats. The 4” CAL shad tail should work very well on the flats since larger baits will be prevalent there. 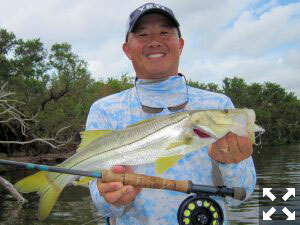 I like larger flies, like Lefty’s Deceiver and EP flies, for snook on the flats for the same reason. Fly anglers should also score with small white flies or Gurglers around lighted docks and bridge fenders. Fish peak tidal flows for the best action. October should be a good month for snook on the flats. Tarpon will still be an option this month. I find them in upper Charlotte Harbor this time of year. Look for them feeding in ladyfish schools or rolling in deep water to find them. DOA Baitbusters and Swimming Mullet are my top producing lures for large tarpon. Fly anglers should score with many of the same flies that work for sight casting to them along the beaches. I use 12-wt fly tackle with a floating or clear intermediate sink tip line for large tarpon. You’ll also find juvenile tarpon from 10 to 30-pounds in many creeks and canals of the Peace or Myakka Rivers. Spin anglers should score with DOA Shrimp or TerrorEyz on snook tackle. Fly anglers can handle the smaller fish on 8 or 9-wt fly rods with fast sinking fly lines and a scaled down version of any fly that large tarpon will eat. I’ve also found tarpon feeding heavily in the coastal gulf in October. They are usually scattered over a broad area, feeding and “blowing up” in bait schools. This “reverse migration” may only last for a few days but it can be really good! Switzerland's Tatiana Migliaretti in a previous October. Big schools of reds that are more common in August and September will break up into smaller schools, singles and doubles by the end of the month. As water cools and baitfish school up, reds will feed in shallow water. I like to pole my flats skiff to hunt for reds in shallow water. Focus on baitfish or mullet schools to find reds. CAL jigs with shad tails, including the 4” CAL shad tail, DOA Baitbusters or Airheads are some of my favorite lures to locate reds with. If the tide is very low, weedless-rigged CAL shad tails and Airheads or DOA Shrimp rigged backwards will work well in the thick turtle grass. Once I’ve located fish, wading is often the best way to approach them when fly fishing. I like a long leader (12’) on a floating fly line with a lightly weighted fly with a weed guard, like my Grassett Flats Minnow. When you have good sunlight, you may be able to sight fish them on light colored bottom, like sandbars or potholes. You’ll also find big trout in many of the same areas in shallow water. I would approach locating big trout the same way as reds. Focus on baitfish or mullet schools to find them and use the same lures and flies to catch them. Some of the best action that I’ve experienced with big trout was at first light with big trout feeding in baitfish schools in very shallow water. You’ll find trout of all sizes on deep grass flats. Wherever there are small trout, there may be a few “gators” around since big trout will eat small ones. Mixed with trout there should also be blues, Spanish mackerel or pompano. In addition to focusing on bait and birds, I like to drift and cast ahead of the drift with CAL jigs and shad tails or DOA Deadly Combos or a lightly weighted fly on a sink tip fly line to find fish. When toothy fish are around add 6”of heavy fluorocarbon (60-lb) or wire to prevent cut offs. 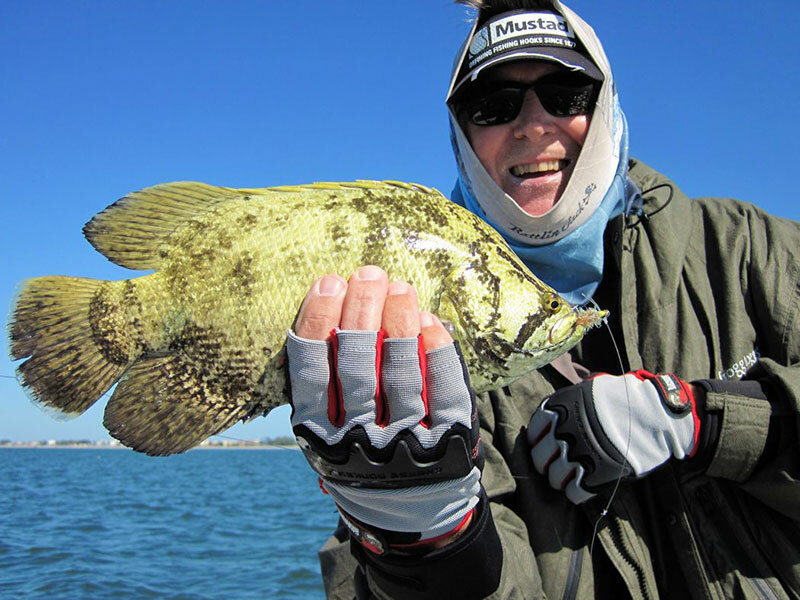 In October, there should be good action with tripletail. You may find tripletail or cobia around buoys, crab trap floats or channel markers in inside waters or the coastal gulf. 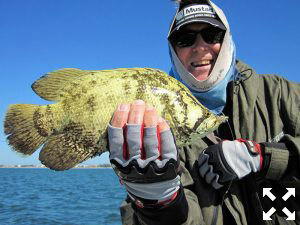 A DOA Shrimp or CAL jig with a shad tail will work well for tripletail. Fly anglers should score with lightly weighted flies with a weed guard. A DOA Baitbuster, 4” CAL shad or Airhead on 20 to 30-pound class spinning tackle or a wide profile tarpon fly on a minimum of 9-weight fly tackle will get the job done with cobia. Look for Spanish and king mackerel or false albacore in the coastal gulf. I look for diving terns or “breaking” fish to find them. Once you’ve located feeding fish, a CAL jig with a shad tail or jerk worm or a size specific top water plug will work well for spin anglers. Fly anglers should score with olive, chartreuse or white flies, poppers and Crease flies. You’ll need wire or heavy fluorocarbon when mackerel are in the mix. You may also find a few kings around the edges of feeding frenzies. I don’t usually target kings, but I will catch a few when fishing breaking mackerel or albies. You can also look for tripletail or cobia around crab trap floats, buoys or channel markers while searching for mackerel or albies in the coastal gulf. October is one of my favorite months. It’s nice to do something different, so I like to fish the coastal gulf for mackerel, false albacore, tripletail and cobia when conditions are good. There should also be good action on shallow flats with reds, trout and snook or tarpon of all sizes in upper Charlotte Harbor. Night snook fishing in the ICW heats up as the water cools down. Our natural resources are constantly under pressure from freezes, red tides fueled by agricultural and residential runoff, increasing fishing pressure and habitat loss and degradation, please limit your kill, don’t kill your limit!